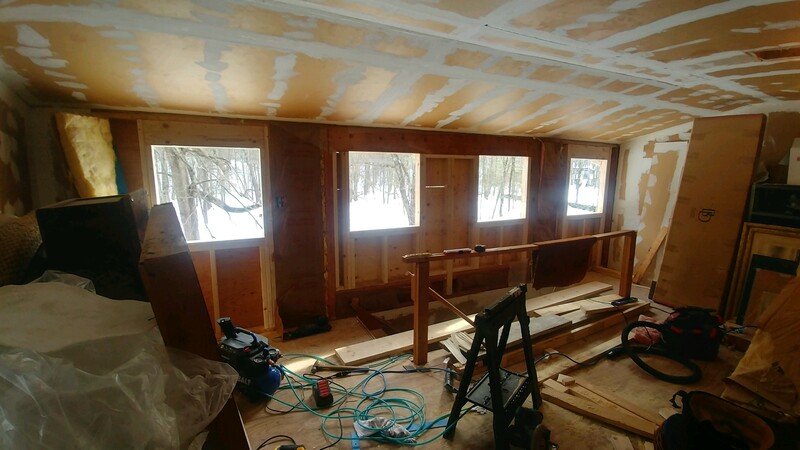 The goal is to complete a room or space from start to finish in 6 weeks. There are 20 “Featured Designers”, and over 200 “Guest Participants” and such a range of projects and design styles – it is worth every minute for the incredible inspiration and creative ideas you will find here on every post…I look forward to showing you all the ups and downs in my little corner of this world! 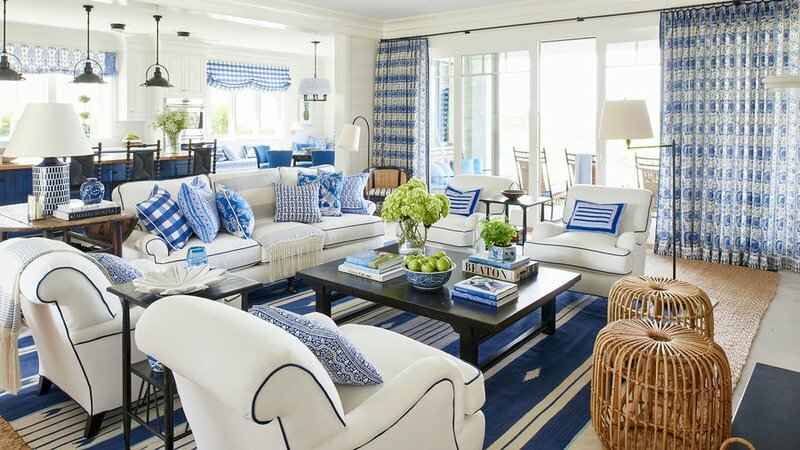 Log in to “One Room Challenge.com” and settle in for the fun. 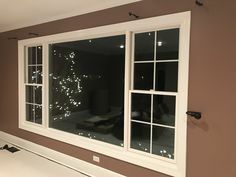 The One Room Challenge is so great at giving me the kick in the pants I need to get a project in my own home completed! Last Fall for the ORC, I worked on my sons’ childhood bedroom and revamped it into a Guest Room and I ran into a lot of emotional discomfort that surprised me! 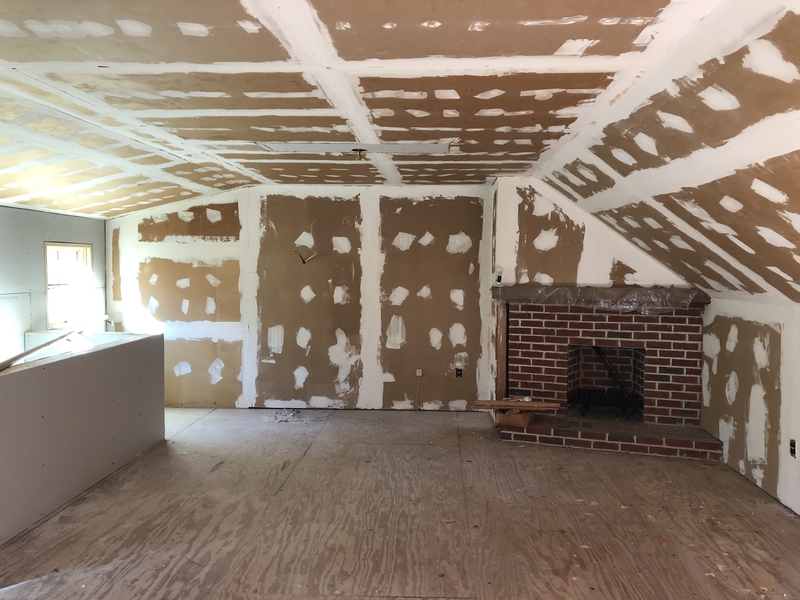 (You can read about that in my previous blogpost)….the point being that sometimes there are reasons other than time and money where a room doesn’t come together! I will swing back around to talking about last Fall ORC as we move forward on this new session, just to catch up on that design project – hopefully that will give others encouragement when they run into mental design roadblocks! 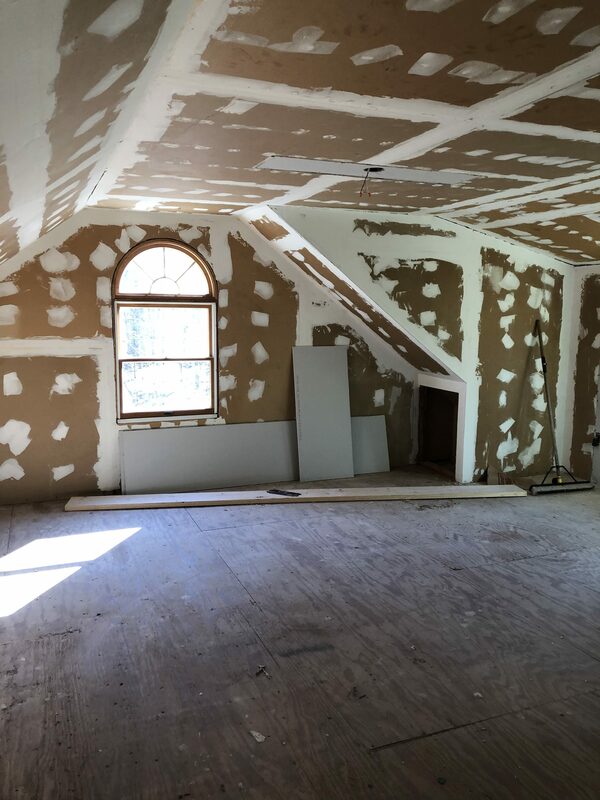 But….for THIS SPRING…..I am so excited to work on a space in my home that has been neglected for years!! 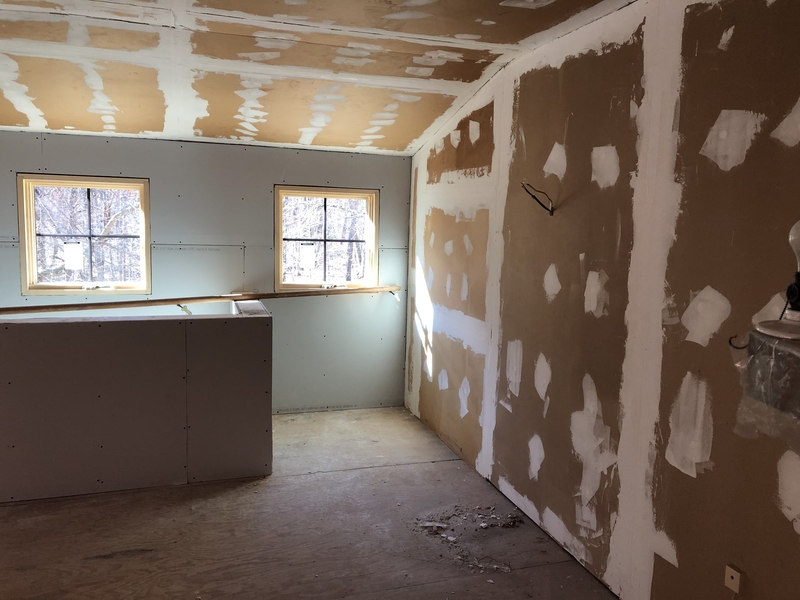 A “Bonus Room” that never came into being over our garage….this space had the potential to be so great and we just never got to it….now we are charging full speed ahead to create this Multi-purpose room for Reading, Games, exercise, peace and quiet….it could be whatever we choose! I haven’t come up with a catchy name yet, maybe you have a suggestion? Leave me any ideas in the comments….or just cheer me along as we fulfill its promise, haha! Even this doesn’t really convey the sadness, because the picture is so clean and white! Think old wood frame window in a neglected room and you are nearer to the reality! 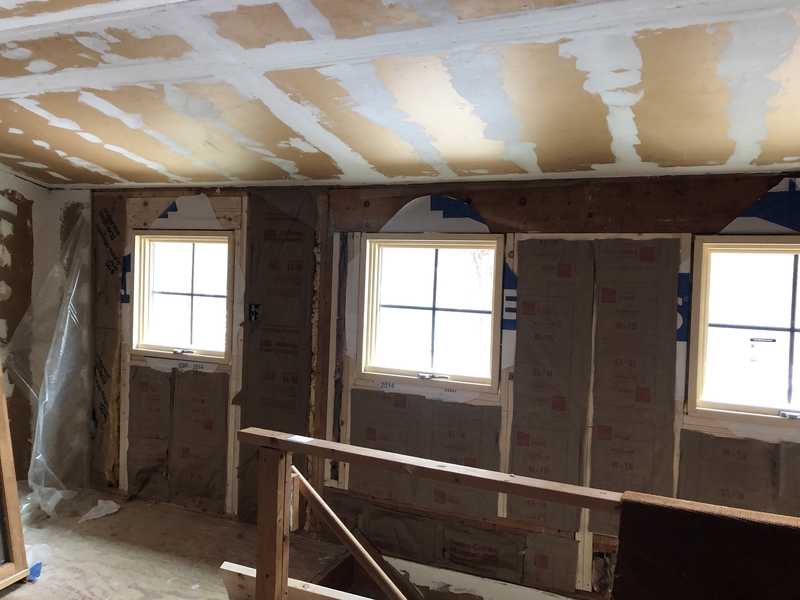 The brown wall is old drywall, half patched and taped- this will all be re-done. This was previously a dark corner, now filled with light! 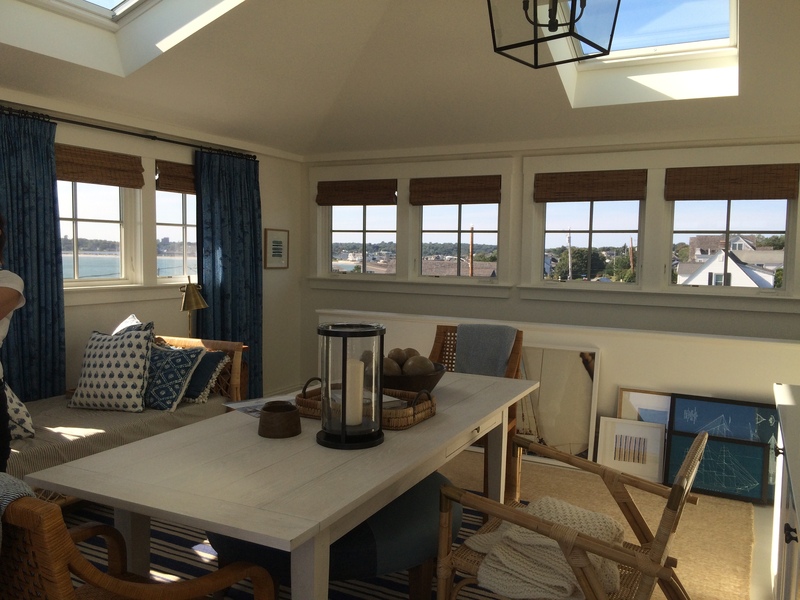 I knew when I visited the Coastal Living Idea House in Newport, RI in the summer of 2017, it would be filled with inspiration from Mark D. Sikes. 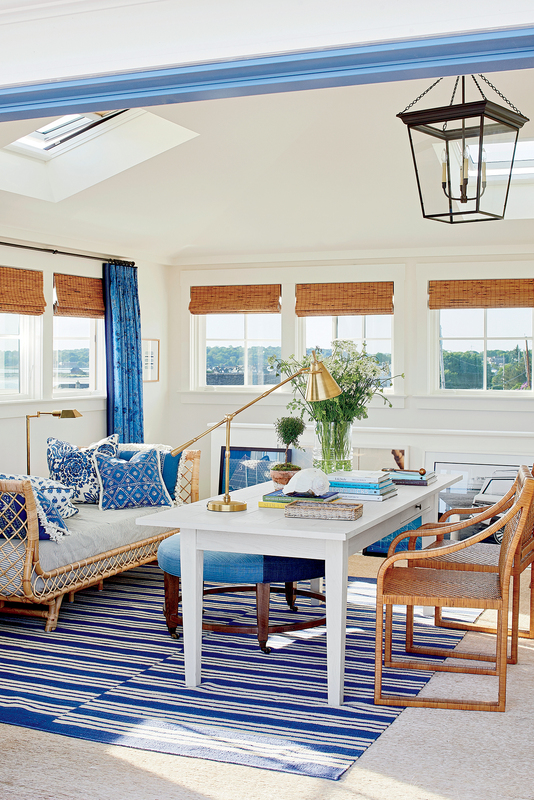 He is a specialist in classic Coastal Style and he has a particular love of Blue and White. I was intrigued at how this house would feel in person using this very strict palette…..would it feel repetitive? Too much? Too specific to the beach/ocean? I am happy to report that it was NONE of those things!! Inspiration for days at this house in wallpaper choices, tile designs, curtain trims and styles….it was all pretty gorgeous! 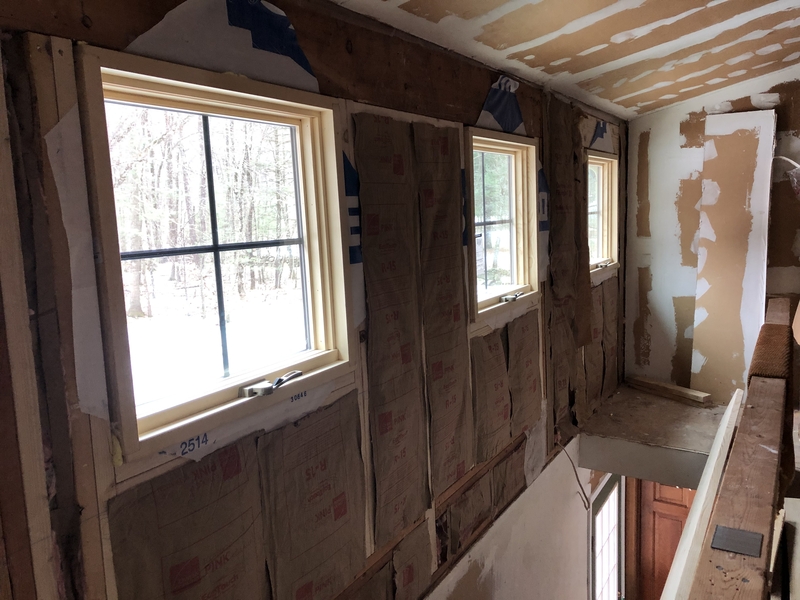 What I did not expect to find was an architectural arrangement of windows and stairway that would be the exact same situation as in my house….here was the solution to my “room over the garage window problem”. 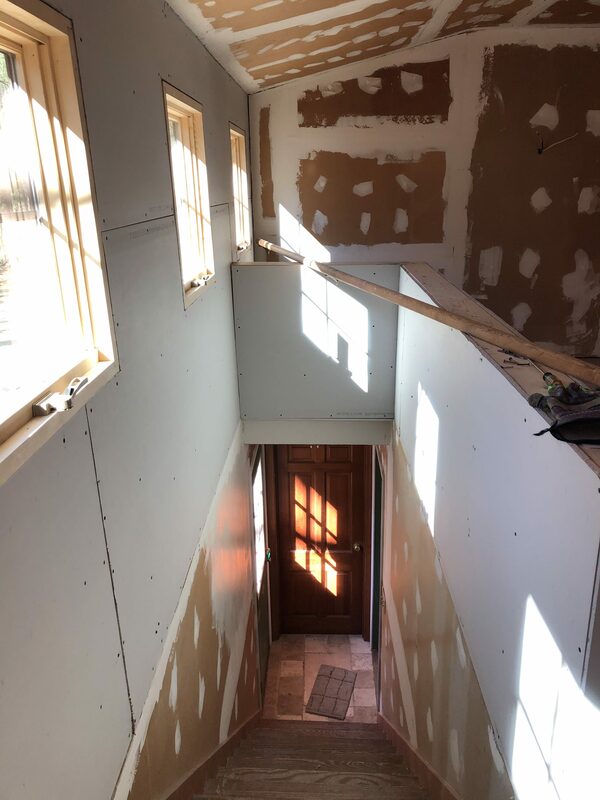 I knew as soon as I saw the Idea House stair and room over the garage, it would work for me and change everything for the better in my room and stair in Hollis, NH! 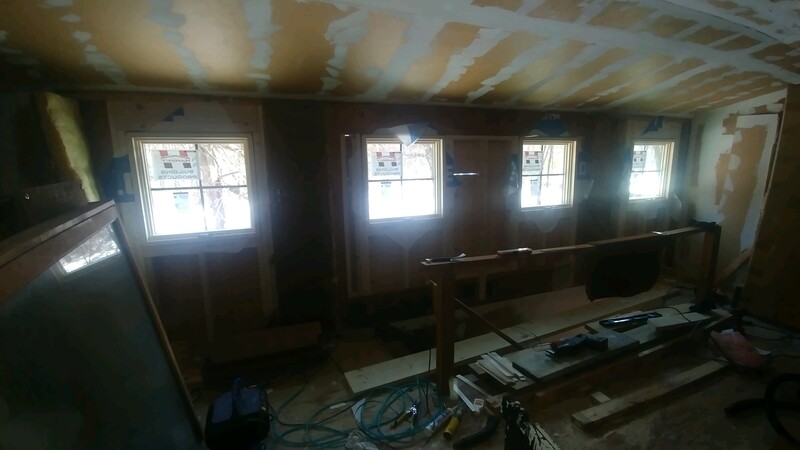 The windows are closer together, plus I have no option for any skylights…but, as you can see, the general layout is exactly the same as far as the stair and side wall and I am so pleased with how my vision of the new windows looks in real life in MY space! 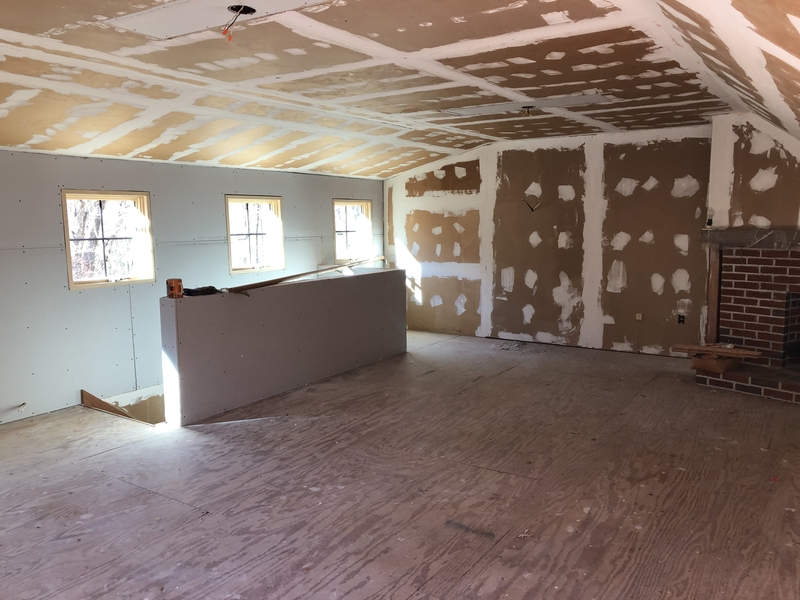 Here is the cleared-out room, swept and ready for the drywall contractor to come in and make this a clean, fresh slate for the rest of the construction and decor! Next steps after the drywall is taped and mudded is the moulding trim around the windows, and the new baseboard. So here we are on the first week of the One Room Challenge! Now we are ready and raring to go to create the Multi-purpose Retreat! I love a clean slate, don’t you? Please come back next week to see the next step of this transformation and all the other ORC plans and details!! Cheers! And here’s to new beginnings!! Its a date!! An get-together with all my designer gals would be awesome!! thanks for following along and I can’t wait to see what going to happen in your little jewel box….